Autumn season come in Japan. 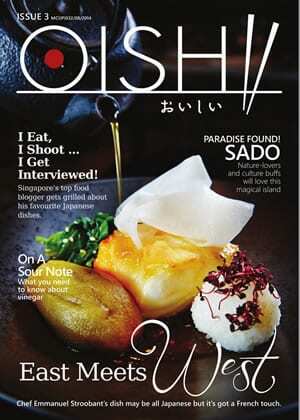 We start “OISHII TV” from this issue. With the image and movie make you attract more and more. This issues contain the sweetest recopies for Autumn and stories of creative culinary professionals of bakery. The regional feature is Sado Island in Niigata. I Eat, I Shoot… I Get Interviewed – Singapore’s top food blogger gets grilled about his favorite Japanese dishes. East Meets West –Chef Emmanuel Stroobant’s dish may be all Japanese but it’s got a French touch.